And so I take a walk. I leave the house, walk down a steep hill, the concrete clean from last night’s rain, sidewalks strewn with yellow and green leaves. I walk over Market Street on a bridge, passing a woman talking loudly on her cell phone, her dog giving me a suspicious look as if to say, “are you the one making my owner act like that?”. I climb stairs, wind along a small trail past an elementary school, and along a flat, residential street that hugs the side of the hill. I smell paint, and pass a man spray-painting a lamp gold, brown hands holding the metal against a sheet of plywood in his sunny garage. Finally, I reach the last set of stairs, up the mountain, and I’m there, at the top of one of the peaks (there are actually 4), surrounded by panoramic views of the city, bay, ocean, and a sky full of clouds. I walk up and down the four peaks, sneakers slipping on old, weather-worn wooden stairs caked with mud. The hills are bare, no trees, just scrappy bushes and bright green fall grass, which always pushes up through the dry summer grass this time of year. No one else braved the possible afternoon rain, so I’m alone. I see scrappy, brown birds with bodies as small as plums, hopping about in the wet grass. 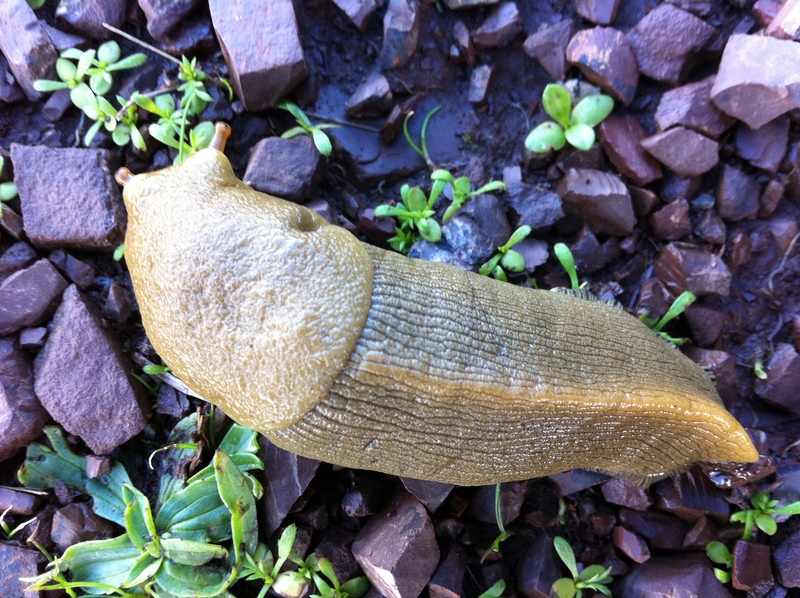 I see a fat, mustard-colored banana slug, sliding along the rocks. At the top of one peak, I stand, braced against the whipping wind, trying to stitch a 360 degree picture on my phone. * Between the cold and wind, it’s hard to hold still, and many pictures have fissures of overlapping color, shape, sky. 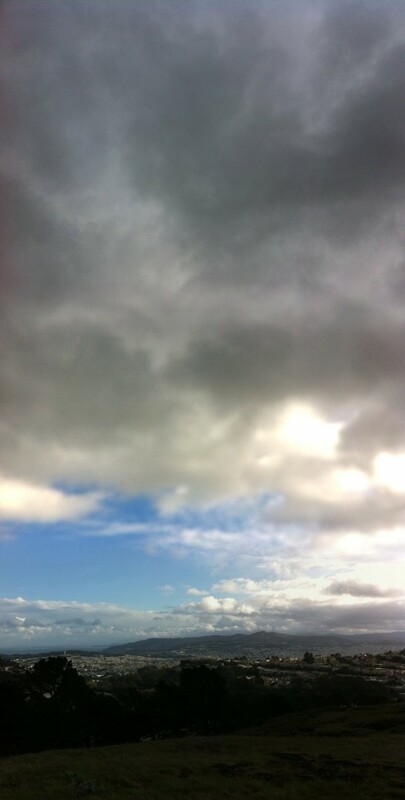 I play with vertical panoramas, adding layer upon layer of sky to the glowing pre-storm horizon. Then the rain starts, but I keep turning in circles, trying to take a full 360 degree panorama of the city. My hands are cold, raw. I put on a fleece headband and tighten the strings in my hood. The rain comes from the northwest, hitting my hood with a hard “thwap thwap thwap”. So I head home. 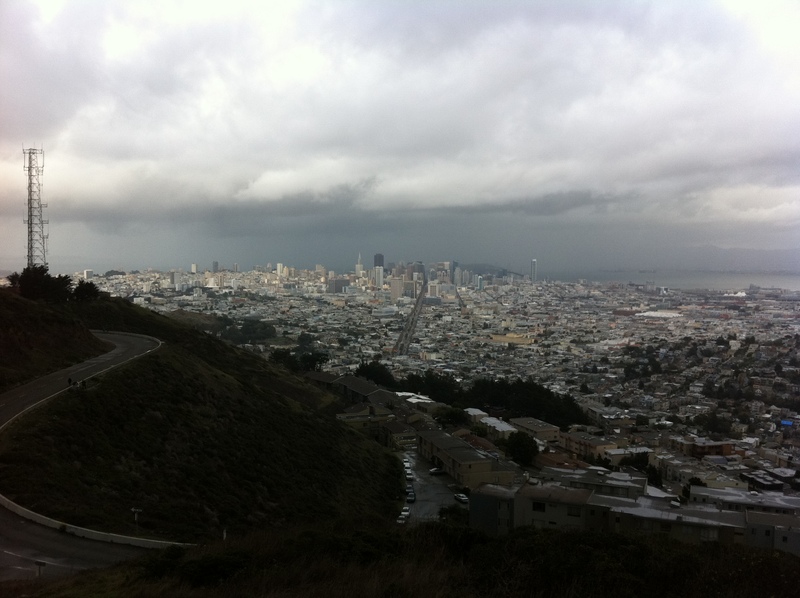 I walk down the last hill, noticing how the view of downtown San Francisco is obstructed by a sheet of rain. I can’t see the downtown towers, only vague outlines, and the gray blur of water falling in the distance. I cut right to follow the path, my shoe slipping a little in the dark mud. When I reach the street, I cross, and rejoin the path down the last hillside to a neighborhood street. I look downtown again, and the rain has passed. Market is clear all the way to the Ferry Building. The skyscrapers of the financial district stand tall once again, and I can even see the East Bay hills beyond. The rain has stopped up here on the hill too. I walk home, considering how a storm, a mood, can come and go so fast. I can’t stop saying to myself, “see, it can all change in a moment, a storm can blow in, rain pelting down, and if you focus on your path, one foot in front of the other, by the time you have a chance to look up again, the storm has passed”. 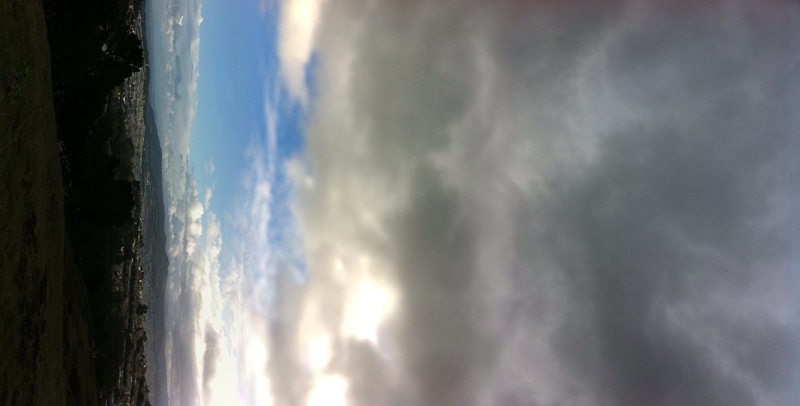 *I took the panoramic pictures with a fabulous iphone app called “Pano”.